Richelle Mead lays some beautiful groundwork in The Golden Lily that left me dying to read the next novel in her Bloodlines series. Big changes are coming for Sydney and we start to see her change and evolve in The Golden Lily. Sydney now is the head Alchemist in the Palm Springs area, which means she doesn’t have someone nearby watching her. Her superiors are impressed by the way she’s able to keep a professional relationship with the Moroi vampires she must work with. They impress upon her the importance of seeing them as unnatural, evil things nonetheless. It’s important to work with them to keep the evil Strigoi at bay, but she isn’t to be friends with them. And that’s the problem. She now cares about them. Adrian, particularly. She still avoids touching the other vampires, but when it comes to Adrian, she sees him as a person. She’s starting to see the others as caring, innocent people — not blood drinkers. And this conflict — trying to remember not to question the teachings of the Alchemists — is what makes Sydney’s journey interesting. She beginning to question her beliefs and that can be agonizing. Plus, everyone pushes her to date. There’s a very smart boy who is an on-paper good match for her. They have a nice time, but kissing him doesn’t evoke fireworks. 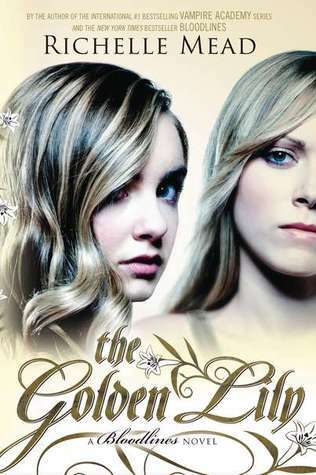 The mystery element in The Golden Lily isn’t as strong as in other Richelle Mead novels, but Sydney and Adrian’s character growth makes up for it. I love that Mead has made it so that I don’t care about Dmitri from the Vampire Academy series being on page as much as I want to see what Adrian is doing or feeling. She’s given him the depth we all knew was there, and someone to really inspire him. While it wasn’t a single-sitting read, like many of her other novels are, I still really enjoyed The Golden Lily and based on the hints dropped in this book, I am eager to get my hands on book three The Indigo Spell. I enjoyed the book but I thought she was way too obtuse I mean come on, especially when she sees it in others (trying not to spoil anything). I still went SQUEEEEEE when Dimiti walked in the room 🙂 Ilike GL a lot better than Bloodlines. GAH! Chelsea, it’s all your fault I picked this up in the first place and now I have to wait for-EV-er for the third in the series. Frustration, thy name is publishing dates. I’ve never been a ‘shipper but I’m all for Sydney and [name redacted for spoilerishness]. I wasn’t a fan of his when we saw him in… uh… previous settings (I’m awful at writing around spoilers) but Mead did a great job at fleshing out the character and making him much more likable without changing the core of his personality. My wallet hates how easy it is to download books at 1 AM like I did this one. I love it. Yes, my brain adores you! BTW, my wallet is thankful the library got an Iron Druid 1-3 compendium eBook last week and I just finished number two last night. I picked it up as soon as it was released, but just got around to reading it (not done yet, but probably tonight)! I’m really enjoying the character development in this book.